The Personalised Handstamped Charm and Birthstone Necklace is a beautiful modern silver or rose gold pendant necklace with a birthstone of your choice. STEP 5: Add an additional charm? 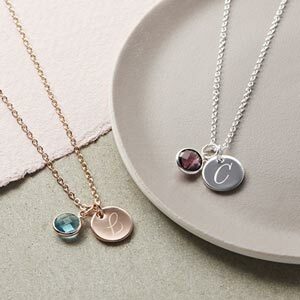 The Personalised Charm and Birthstone features a silver or rose gold plated trace chain with the choice of a dainty disc, stylish star or classic heart pendant and swavorski birthstone. 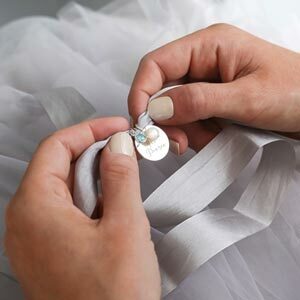 Pick from a disc, heart, or star charm and the option to add an additional charm. Beautiful necklaces, fast delivery. Perfect! Thank you for your review and I am so sorry to hear that you are not happy with the quality of your order. Please note that plated items may tarnish over time especially if it comes into contact with water, lotions and perfumes. We would however be happy to look into this for you so please email an image of the item your received to enquiries@bloom-boutique.co.uk. Lovely quality and clarity. Thoughtfully presented.